Netflix’s Orange Is the New Black is awash in buzz and critical acclaim. In its first week, it reportedly outpaced the viewership of both House of Cards and Arrested Development. And yet, yesterday afternoon, Buzzfeed reported that one of the show’s stars, Laura Prepon, was heading for the door. According to the site, the actress will appear in only a limited number of episodes next season (downgrading her from series regular status) and had not yet signed a contract tying her to a third. A rep for Netflix said the report was “not accurate,” and that the second season, currently in production, was still developing and nothing was confirmed. This is all very confusing, but there are four possibilities to what’s going on here. 1. The reports could be false. Prepon will be back, eyebrows and all. 2. It’s a negotiation tactic. 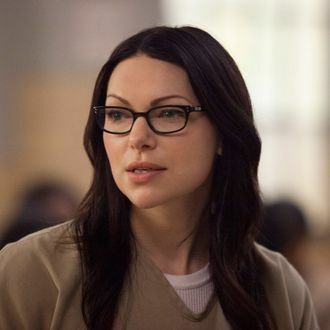 Prepon’s people put it out there to force Netflix to pay more for her and her eyebrows. This seems unlikely; this kind of thing would have been locked down before production started. 3. Her character will be leaving the prison for a few episodes, but will be coming back later. Hence THR’s careful wording that Prepon would “not return as a series regular” and Netflix’s statement that the season was “still developing”: Both leave open the door that Alex, like Tastee, could be freed or transferred to another prison, only to end up back in the Litch. 4. Alex is being killed off, something planned in advance. This is also possible, but would be a bummer — less for any specific devotion to the character itself (fans seem divided) than for what it says about how easily plot twists can be spoiled in the era of all-episodes-at-once delivery. With entire seasons being done far in advance, it becomes far easier for actor departures to leak long before the episode airs. See what you’ve done, binge-watching?